My Android app (v.8.9) and the new Web app limit the number of shortcuts displayed to six. I have, and use regularly, just over 20. Limiting my shortcuts to the six most recently created or used might simplify the UI but it renders the shortcuts feature pretty much useless! I get the desire for a cleaner UI, but please, let me make that decision. If you must limit the number displayed, make it a setting. I invested a lot of time building those saved searches and make the shortcuts, and they save me time each time I use them. Now, I feel like you've taken that time away from me. Please, may I have my shortcuts back? I only see version 8.9 under Settings > Support > Check for Updates in my Android app. In Google Play, it says 8.9 as well, updated March 28, 2019. Nothing more granular than 8.9. How would I revert to an earlier version, such as, I'm assuming, 8.9.3? The web app allows you to switch back to the previous version. All of my shortcuts display there. In addition to hiding most of my shortcuts, the new web version also removed all of the tag hierarchy-- another deal breaker for me. I just wish Evernote wouldn't just, willy nilly, take useful functionality away. It's very frustrating. Hmm, the current Web interface (at least, I think it's the current one: https://www.evernote.com/client/web) shows all 8 of my shortcuts. Since you're a Premium user, you might want to submit a support request and ask whether this functionality has been changed. I'm a Beta user, and -theoretically- have the latest version of the apps. Sounds like you have the latest general release version though, that (I'd forgotten) came out a few weeks ago. If you'd like to advance to the beta version, see these instructions, but also note that betas may not be fully house-trained in other respects - see comments above. @gazumped Play store now offering ver 8.9 updated April 4, 2019. I haven't paid much attention to this since I left the Beta, so I don't know if it is normal for EN to release an update without incrementing the version number (as it appears 8.9 was first released on March 28). Also on 3/28 at 18:58, Alexis M wrote an update to my ticket 2804215 stating that version 8.9 [specifically, what the activity log calls ver 8.9(1082733) Evernote revision: 8.9_2452 ] was Beta. The activity log I just generated on my Pixel 2 XL which is running the GA app says 8.9(1082793) Evernote revision: 8.9_2461 i.e. only minor changes between the two. So it appears EN took Beta software with known, show-stopper issues, and pushed it into production. This is still shocking; I wish it was a surprise. @Bill Clarke do you happen to have an activity log from the version of the app you were using when you reported this problem? It would be interesting to know the build number [ the 7 digit number in parentheses ] and the revision number. I'm still trying to get my head around 8.9.3 Beta assuring me that it is the 'latest version' when 8.9 has already been released in March (or April) and presumably should have incorporated any bug fixes from feedback received... The Android team seem to have their own interpretation of correctly formatted version numbers. As far as the web version goes, the Current version seems to be the one that is feature complete at this point, and the "newer" version is actually a Beta. There's another thread that discusses this in some detail. Net of it for me is to use what's referenced as the Current version until EN reports they have introduced a new, not-Beta version. 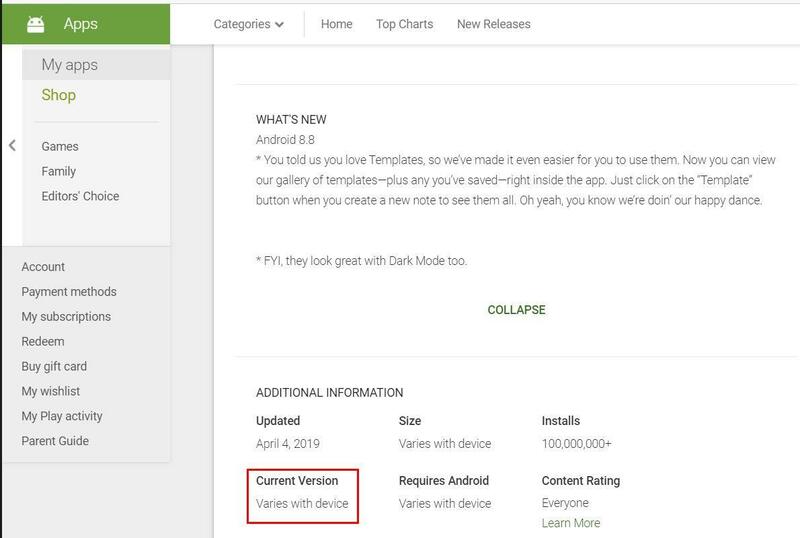 @gazumped Play store now offering ver 8.9 updated April 4, 2019.